The Republic of Letters is one of those fascinating history books that introduces an almost completely new element of analysis into already well-known events. It is not, however, a piece of revisionism, much less, as the British conservative Theodore Dalrymple brilliantly puts it, a “backward projection of current discontents.” It rather delves into a now-forgotten element of the past that actually existed at the time, and thus makes the past more real. But the term was not merely used to refer to this savant enterprise. These “men of letters” also self-consciously understood themselves to be part of a “Republic of Letters”—they used the term in their letters and dedications—which was viewed as a secular analogue to Christendom and the Church. It was not quite as formal as the Church, but it was a self-aware fraternity with a concept of membership, not merely a term applied to scholarly collaboration in general. 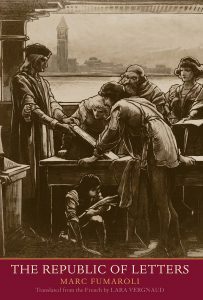 The idea of this virtual “Republic” began in the pre-Renaissance with Petrarch, who resurrected the ancient Greek and Roman idea of “the education of a cultured and sophisticated elite that was capable of offsetting … both the mob and the man behind the mob—the tyrant.” (The term itself, used liberally by its participants, dates to 1417). Thus the Republic of Letters was not a head-in-the-clouds academic affair, but a self-conscious attempt to bring the treasures of antiquity to bear, both for spiritual and philosophical edification and to promote greater international openness, understanding, and peace. It was also surprisingly long-lived; Fumaroli calls it a “democracy of peers … which endured over several centuries of monarchism and aristocracy.” Though with shifting groups of participants and centers of power—Venice, Rome, Paris—the “Republic” in some self-aware form persisted nearly until the French Revolution. It might appear that this literary Republic would be in conflict with the Catholic Church. One of the greatest surprises of the book is that this is not true. Fumaroli explains that there had always been a certain “preestablished harmony” between Christianity and classical antiquity, as well as between Christian monasticism and “lettered leisure” and the “life of the mind.” Many popes, bishops, and other clerics were patrons of literary works and even participants in the Republic of Letters, just as they were patrons of the arts. Many of them viewed the missions of the Church and the literary republic as complementary and analogous, promoting peace and enlightenment through different means. The history of Catholicism and literary humanism is not a story of religious suppression; it is largely a story of sometimes fractious cooperation and mutual understanding. Of course, these men of letters were to some extent constrained by the Inquisition and the Index of Forbidden Books. One of them wrote a book that ended up on the Index—before being invited by the Pope to work in the Roman chancery! The anecdote underscores how closely intertwined the ecclesiastical authorities were with the secular men of letters, even if they didn’t always see eye to eye. It is clear that the members of the Republic of Letters constituted a European elite; Fumaroli dubs them an “aristocracy of the mind.” But they were not an aloof or self-hating elite. They prodded their countries and societies and Church to be better, but they did not renounce them. They also did not believe in the linear view of history and Progress, in which whatever is new is superior. Their erudition, humanism, and humility strikes one as distinguishing them from the elites who inhabit the contemporary academic and corporate worlds. Who, then, were these lettered men exactly? Erasmus, Petrarch, Boccaccio, Dante, Salutati, Voltaire, Montaigne, Leibniz—all these names appear, along with many lesser known diplomats, scholars, clerics, and others who participated in the virtual Republic. It is remarkable, then, that the term and the concept have been so neglected in histories of these men and their time. It should be noted that The Republic of Letters is a very, very dense book; what I have recounted could be almost infinitely fleshed-out (but by that point, it would be better to simply read the book). For example, early on it contains the sentence, “Rene Pintard does introduce nuance and a sort of new nominalism into the psychomachy of the principles of intellectual history …” There is no shortage of such sentences. It is likely that anyone qualified and educated enough to understand everything in this book has no need to read it. Even so, it is still a worthwhile and fascinating read. There are other interesting tidbits sprinkled throughout. One is an early discussion of the collateral damage wrought by progress. Fumaroli notes that the printing press and the industrially printed Bible were major causes of Europe’s religious schisms and wars, a development that tested the Republic of Letters. Also, as you might expect, the book is full of people you may have never heard of. This presents a sort of meta-experience in which reading about this society of the living and dead connected by scholarship allows anyone inclined to take the time to partake in it oneself. Finally, the book includes, in a translation of a biographic letter, the term “Braggadokies,” referring to braggarts. That is a brilliant expansion of one’s vocabulary. The only obvious critique one could make of Republic of Letters is that it analyzes the activities of the literary men in something of a vacuum—there is little sociological analysis or contextualizing of their work. For example, they are clearly among the elite, many holding positions of secular or ecclesiastical authority and having the leisure time to engage in the study and discussion of the arts and humanities. The reader gets no sense of whether they relied on slaves, servants, or a massive underclass to support their leisure, or whether there were “classes” of sorts within the literary and scholarly worlds. We also do not know if they themselves considered the broader social dynamics within which they were embedded. Such an analysis would add a layer of context and human interest to an otherwise dense and scholarly book. But it is not necessary, and the comprehensive portrayal of an understudied aspect of the Renaissance and Enlightenment remains.